The MimioDisplay 5510 supports a 55” large HD display, with LED backlit and high contrast ratio and brightness. Not only does it deliver a crisp and bright display, but with great viewing angles and colour reproduction, it provides a vivid platform to work with. This 1080p display features the Touch 360° tracking technology that marks accurate touch responses and gestures and aids smooth finger movement on the low glare, low friction glass surface. The Windows 7 and higher OS supports both touch as well as gestures. These can be either 10 points of single touch or 5 point of dual touch simultaneously with either fingers or a stylus. The Linux and Mac OS support only the single touch. Furthermore, the MimioDisplay 5510 supports a MimioStudio software licence in the package that helps in collaborative learning by developing engaging lessons and assessments. 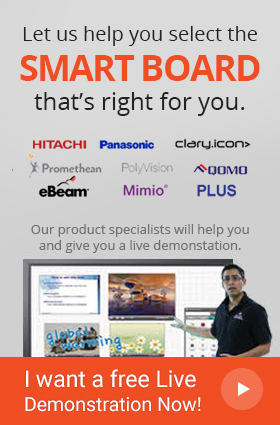 This further allows easy integration with other Mimio products and the MimioMobile apps. Further connectivity with other devices is eased by the number of ports the 5510 packs, some of them being the HDMI, VGA and the USB and he audio connections, making it complete multimedia bundle. Operating System Windows 7 and Windows 8: Includes multi-touch and gestures. Mac OS and Linux: Single point. Q: Does MimioDisplay 5510 come with the ability of supporting multiple users? A: Yes, the 5510 Interactive Touchscreen can recognize up to 10 simultaneous touch points. Q: Is a stylus necessary to operate MimioDisplay 5510 interactive touchscreen? A: No! The MimioDisplay 5510 can also recognize commands from fingers or any other sold object. Q: Does MimioDisplay 5510 come with a built – in PC or Android system? A: No, the users would need to use a separate PC with this Interactive Touchscreen. Q: Which operating systems are compatible with the touchscreen display? A: All popular operating systems are compatible with MimioDisplay 5510. Windows support multi – touch and gesture recognition while Mac and Linux support single point. Q: Do I get a warranty with the purchase of MimioDisplay 5510 Touchscreen Display? A: Yes, the users get a warranty of 2 years upon the purchase of MimioDisplay 5510.